Okay, keep your party hats on for the duration of this post and hold onto these. Lick the pink mustache lolly when you’re naughty, the green one to walk on the wild side. Little green Mr. Caper is beloved by grown-ups for his sour, acidic earthiness. Rotund, bald men in lederhosen sporting massive mustaches ogle him. Buxom, kerchiefed mamas hyperventilate with gusto whenever he strolls by. But is Mr. Caper satisfied? “Bah!” he says, not caring a whit. All Mr. Caper can think about is Lollipop — sweet tangy Lollipop, whom all the kids adore. Insanely jealous, Mr. Caper wants children everywhere to love HIM. Surely they can learn to appreciate his complex flavor! So he devises a plan. He sneaks into the Lollipop Factory and adds caper juice to the lollipop batter. 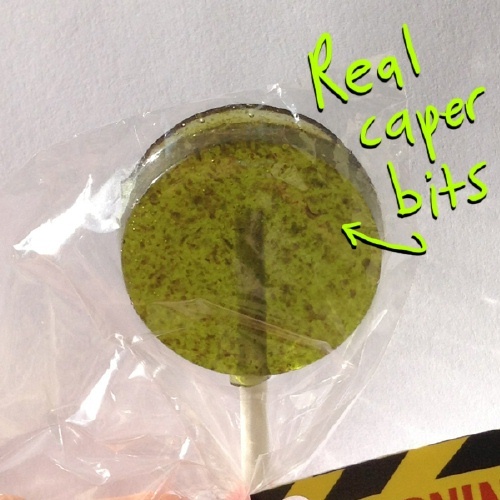 Soon, caper-flavored lollipops are shipped far and wide and there is much licking, licking. Surely now kids all over the world will love Mr. Caper!! Or will they? Uh-oh. We’re talking bad grades, tantrums, sticking their tongues out at their parents! Now everyone was angry, and nobody liked Mr. Caper. Havoc and mayhem everywhere! What to do? Fans of both the salty and the sweet will find something to chew on in this dynamic, quirky, giggle-inducing dramedy. A lean, suspenseful narrative flavored with punchy dialogue and bright, eye-popping, cartoony pictures keeps things moving at a good clip. The thing is, regardless of age or circumstances, we can all identify with Mr. Caper, the villain we love to hate. When it comes to craving attention, being popular, getting drunk on power, and the insatiable hunger to be loved for who we are, we’re all guilty as charged. Without getting too “message-y,” The Great Lollipop Caper illustrates the importance of understanding the motive behind an action, as we feel sympathy for Mr. Caper by story’s end. There is also a strange sense of empowerment kids will appreciate knowing that one tiny wrinkled green thing can cause so much trouble. Other takeaways: you are what you eat, it takes all kinds (variety is the spice of life), your time will come, it’s okay if not everybody likes you, it’s not easy being green. and small. and wrinkled. Distinguished judges give this book an enthusiastic three paws up! The book has been receiving glowing reviews, including a *starred review* from Publishers Weekly, who calls it the “perfect after-dinner read for Food Network-loving families.” Budding chefs and adventuresome readers will likely be curious to try capers despite its billing as “a tiny pickled sourpuss, who lives in a jar in your fridge and is never eaten by children.” A dare if I ever heard one; besides, this caper’s contrite. All in all, a dang funny story not to be missed. Pucker up! I have been coerced promised to mention that great sacrifices were made to bring you today’s celebration soup. Despite being a sweet-loving lot, the Alphabet Soup kitchen helpers bit into, sucked the juices out of, and dutifully consumed hundreds of capers, much to their salty, sour, acidic dismay. To go with our soup, a few caperish side dishes. Now that you’ve had your fill of the salty with the sweet, it’s time to skip on down to your local indie or click through to your fave online bookseller to score your very own copy or two or five hundred of The Great Lollipop Caper. If you go to a bricks and mortar store, wear Hot Pink if you like Lollipops, and Olive Green if you like Capers. Talk up the book in the checkout line, and give any sourpusses a pink lollipop. Be sure to tell the cashier how much you love him/her, and if you’d like a discount, don’t forget the secret password: Lederhosen. Picture Book for ages 4-7, 48 pp. Dan has generously donated two signed copies of The Great Lollipop Caper for two lucky Alphabet Soup readers. He’s also throwing in some lollipops (regular + caper-flavored) to sweeten the pot. *For a chance to win, simply leave a comment at this post telling us whether you prefer lollipops or capers. Extra entries if you tweet, blog, FB, or share details of this giveaway on any of your other social networks (please mention in your comment). **You can also enter by sending an email to: readermail (at) jamakimrattigan (dot) com, with CAPER in the subject line. Deadline for all entries is midnight (EDT) Friday, May 24, 2013. Aren’t you dying to taste one of these? The Great Lollipop Caper Website — download and complete Mr. Caper’s Crossword Puzzle or Lollipop’s Maze, email the solutions and win a prize! Saturday, May 11, 2013, VROMAN’S in Pasadena: 10:30 – 11:30 a.m.
Saturday, July 13, 2013, EIGHT COUSINS BOOKSTORE in Cape Cod: 11 a.m.
BTW, did you know it’s International Caper Appreciation Month? Be a Sourpuss! Get yourself a jar and spread the caper love! This post is being linked to Beth Fish Read’s Weekend Cooking, where all are invited to share their food-related posts. Come join the delicious fun! *Spreads from The Great Lollipop Caper posted by permission of the illustrator, copyright © 2013 Dan Krall, published by Simon & Schuster BFYR. All rights reserved. Well, now I’m craving lollipops and it’s only 7 AM here! (Do lollipops go with Lion coffee? 😉 ) xoxoxo Welcome back! Lollipops today! I tweeted and shared on FB! Thanks for the wonderful review and yummy looking goodies! Thanks for joining the party, Penny — I’ll put you down for 3 entries! Heading over to Twitter right now, Jama. I can’t wait to read this delectable delight of a book. Thanks for helping to spread the word. Do dogs like capers? Jama, Jama, Jama! So glad to have you back! 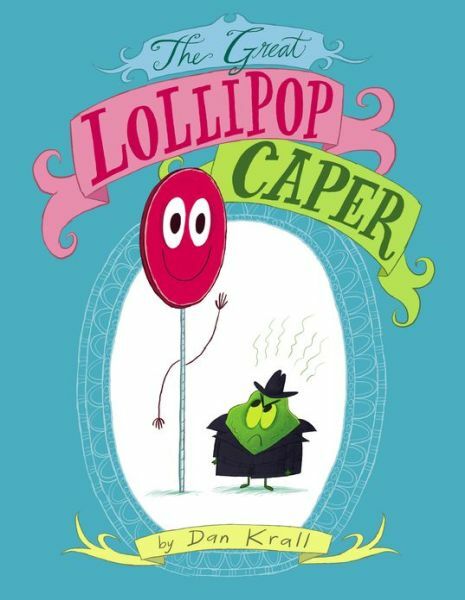 And this book sounds absolutely delightful — even though, I confess, I’m a fan of neither lollipops (too sweet) nor capers (too caperish). I can’t wait to read it. Congratulations to Dan Krall! Sounds like you haven’t had the “right” lollipop yet :). Capers are definitely an acquired taste — though small, they make a big impact in any dish. I confess to liking both lollipops AND capers . . .
p.s. thanks for the FB share! What a clever premise for a story! Can’t wait to read it! I think one hasn’t trully lived until one has tried a caper lollipop? Do they come in “Chicken Piccata” as well? I’m very curious to try those caper lollipops! Surely someone, somewhere makes chicken piccata flavored ones too :). Wow, that’s fun. I enjoy both a nice lollipop and a sprinkling of capers, although I’ve never thought to try them together. Mr. Krall sure has some neat marketing. 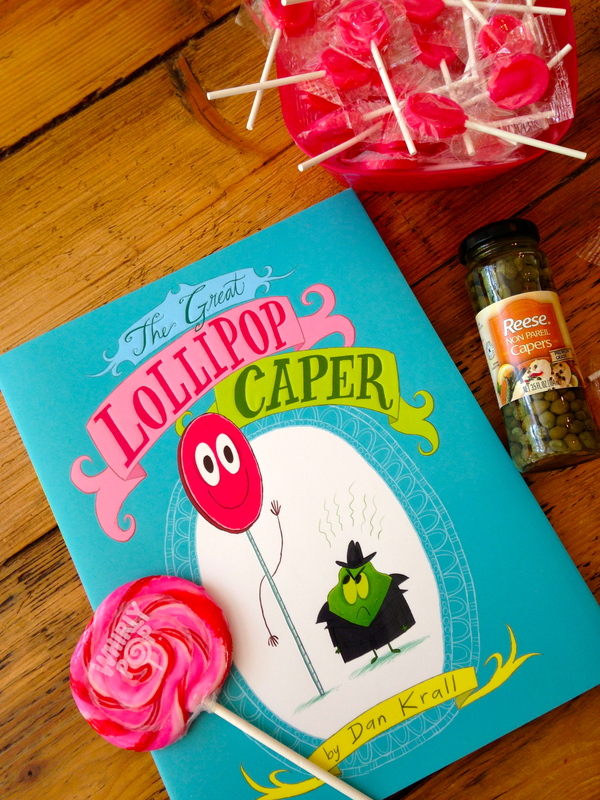 Caper-flavored lollipops are definitely a first! Can’t wait to read this one. I’m voting for capers, here and on my grocery list. Thanks for the delicious review. 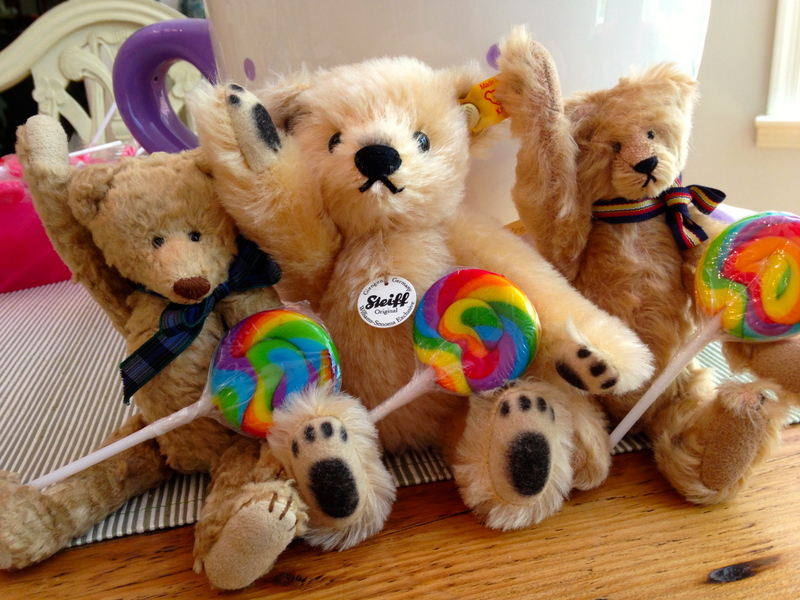 first impulse is to say lollipops – those pictured above looked scrumptious! i also kinda want to try anything that says, “warning, may cause appalling behavior.” that dan krall is one smart cookie. we should label everything good for kids with this. i tweeted and shared on fb, too! That “warning” is definitely a dare/challenge that’s hard to ignore. 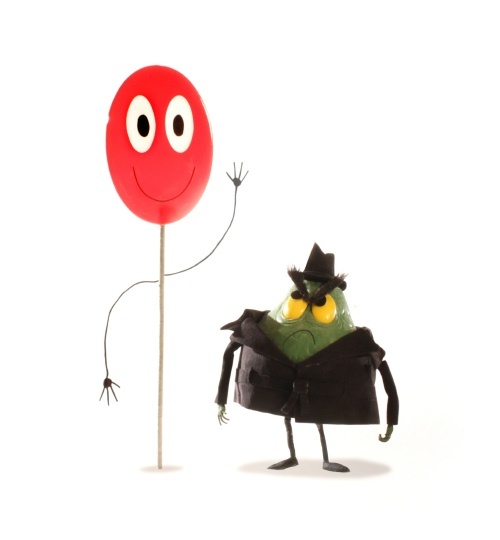 Eating one of those caper-flavored lollipops gives us an excuse to act out :D. Not my fault — blame the lollipop! That sounds like a lot of fun, with some sweet lessons, too. Capers will certainly never be the same — I mean who knew they have such tortured/tormented inner lives? Love your comment — I agree with you and need my sweets too. You never know when a caper is coming on . . .
Hmm… I would like both, but, I guess, I will try the caper-flavored one (to give to Josie – MWAHAHAHAHAHAHAHAHAHAHAHA!!!). Nah. I’m bigger and tougher than her. Piece of ca… er… uhh… hmm… lollipop? Caper? Soup??? Huh. Let me think about this a bit. Size has nothing to do with it. A tiny caper is capable of a lot of damage! I give out lots of lollipops to students at school, prefer the cherry ones myself, Jama. Sounds like a very fun, & silly book, Dan & Jama, but I’m all for silly! Thanks for sharing your big day, Dan! So, you’re the lollipop lady! You may need to add some caper-flavored ones to your stash to keep things interesting :). Not to be caper-pricious, but that yummy chicken piccata photo sealed the deal for me. Bring on the green, small and wrinkled one! Oho! A chicken piccata fan :). Good to know. You are indeed caper-pricious, in the best possible way . . .
Today I’m leaning toward lollipops. Fabulous post! And don’t you just love that video?? It *is* a great video — wish it were a little longer, though. It has a nice retro feel to it. You’ve got quite the spicy clique hanging out in your fridge. Can’t say Mr. Caper was ever a permanent resident in ours — he seems a rather transitory figure with us — but we’re quickly warming up to him since reading his story. this looks like a fun magazine. I am not the biggest lollipop fan but those caper recipes look great. Mr. Caper thanks you — and hopes you try one of those recipes soon :)! The mustache lollipops are too cute! Brilliant! We’re all about capers here… chicken piccata is a personal favorite. Great post. Wow, Mr. Caper is a lot more popular than I realized — must be because I have mature blog readers 🙂 . . . I just love capers too – I make my own sauce tartare with them and eat them with smoked salmon. Yum, sauce tartare — I love fish! Thanks, Tina. Glad you dropped by :)! Well, I AM an adult, so honestly, I’d prefer capers to lollipops. Actually, now that I think about it, I never was a big lollipop fan. Maybe I would have been a better child if I had liked them more, LOL! You sound like the perfect candidate for a caper lollipop! You’re never too old to discover the delights of lollipops :). I love capers in salad dressings and in chicken piccata too. I’m not sure about a caper lollipop. I reserving judgment. I’m sure this is the first caper protagonist in children’s literature! After seeing what got into Cornelius at your other post, I HAVE to enter the giveaway! I resisted entering this for a couple of days because I couldn’t decide between lollipops or capers1 I still can’t! Capers for me, preferably in a lovely piccata sauce. What a fun post… I’m off to tweet about it right now.